Our Certificate in Botanical Art and Illustration program is designed to provide a comprehensive education in botanical art and illustration to people who wish to improve their skills in drawing and painting plants, with a focus on southeastern native plants, in an accurate and technically detailed manner. Studies leading to the certificate will enhance the experience of both the professional and the dedicated amateur botanical artist in producing artistic and scientific images. The program is designed to give students a well-balanced curriculum combining basic scientific background, visual arts theory, and practical experience using various media. Classes are taught by NCBG staff and other area art and botany professionals. Many classes require homework assignments. The amount of time students need to spend on homework varies and usually ranges from five to 15 hours per week for each course. Actual practice time in class is limited, so additional hours spent at home are both necessary and beneficial. Time invested in homework will result in personal artistic growth, and satisfactory achievement in any course requires both time and commitment. Successful completion of the program requires passing grades in 13 core courses and three elective courses as well as submission of an Independent Final Project. Course offerings and scheduling are designed for graduation within a three-to-five-year period. The certificate is a valuable addition to the resumes of students in pursuit of professional work in botanical or scientific illustration. This program is aligned with the NCBG Certificate in Native Plant Studies program, with which it shares some courses. For more information about the program, see the BAI Handbook below. Questions? Contact the Registrar at ncbgregistrar@unc.edu. 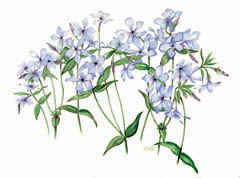 Click here to view upcoming Botanical Art & Illustration courses. FEE: $100 enrollment fee covers administrative costs for five years; courses will entail additional fees. Students must be at least 18 years of age to enroll. Non-refundable. Conventional scientific botanical illustrations are usually created to accompany descriptive text, where the primary function of the image is to provide information and to 'educate' the viewer. Although aesthetics may be of secondary importance here, the illustrator still has some freedom to implement visual considerations. Although the uncolored line drawing (pen-and-ink or graphite) provides the most clarity and detail, and is still the best way to describe newly discovered species, botanical illustrations may also be done in color (watercolor or colored pencil). Botanical illustrations have traditionally been used to illustrate botanical taxonomy articles, where a botanist or horticulturist often dictates which parts of the plant will be illustrated. The illustrator usually has access to live plants, pressed herbarium specimens, and a microscope for viewing plant structures, such as branching stigmas, leaf pubescence, or capsule chambers. The plant is traditionally measured and drawn on a 1:1 scale and placed on a white background. In botanical art, the artist has more freedom to make personal visual choices, to draw the viewer in and evoke an emotional response. Although more emphasis may be placed on aesthetic considerations, the image, however, remains scientifically and botanically correct. The image is still represented on a 1:1 scale and is placed on a white background, favoring true color representation for identification purposes. A botanist examining the image should be able to identify the plant and find no anatomical inaccuracies.